Since 1984, C.O.P.S. has provided healing, love and life renewed for America's surviving law enforcement families. Each year C.O.P.S. continues to advance its mission of giving our survivors hope and encouragement through our programs such as C.O.P.S. Kids Camp, C.O.P.S. Teens Outward Bound®, Spouses Retreat, Parents Retreat, Siblings Retreat, Co-workers retreat, the National Police Survivors’ Conference and many more. We have seen lives changed for the better. With your support you are helping us fulfill our mission. Your support will help pay for the C.O.P.S. programs the surviving families attend. C.O.P.S. provides resources to assist in the rebuilding of the lives of surviving families of law enforcement officers killed in the line of duty as determined by Federal criteria. Furthermore, C.O.P.S. provides training to law enforcement agencies on survivor victimization issues and educates the public of the need to support the law enforcement profession and its survivors. In 1984, a group of surviving law enforcement widows gathered to express the need for an organization that would support their families after their officer had been killed in the line of duty. 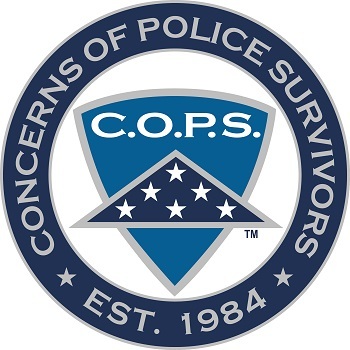 Concerns of Police Survivors (C.O.P.S.) was born that year. C.O.P.S. is the one and only organization that helps the surviving families of fallen law enforcement officers heal emotionally. Too often we hear that death benefits paid to surviving families are the answer, but benefits don’t bring about the emotional healing that occurs when survivors are free to express their feelings and share their grief with others who understand. There are many families that C.O.P.S. has helped through their grief of loosing their loved one by giving our survivors hope and encouragement through our programs. We’ve helped parents, widows, children, step-children, in-laws, grandparents, fiancés, siblings, aunts, uncles, nieces, nephews, cousins, friends, and co-workers. This comment can be heard time and time again as tremendous healing for children and their parent takes place during that week. The miracle of camp is strong peer support….one survivor reaching out to another survivor. Coupled with professional counseling, this camp is often a life-altering event for the families of America’s fallen law enforcement officers. We provide our Tax Returns, Audit Report, and 990 to the public to show what our money goes towards. We also keep track of program costs and attendance by state that is available to anyone that would like it. Donations that are given to C.O.P.S. are used to continue to advance our mission of giving our survivors hope and encouragement through our programs.